Award season is in full swing with the NTAs last week, The BAFTAs on the 10th Feb and The Brits on the 20th Feb! With all that in mind, we’ve featured some of our favourite award ceremony dresses, whether you’re going for a classic all black gown or a stand out sequin dress. Tags: GMD Awards. borrow a dress, circular economy, clothing rental subscription uk Wear the Walk, designer dress hire, Designer Dress Hire UK, Dress Hire, dress hire glasgow, dress hire london, dress hire UK, dress rental, dress rental london, dress rental uk, girls meets dress, hire a dress, hire a dress UK, hire designer dresses uk, hire dress, Hire dresses, rent a dress, rent a dress london, Rent a dress uk, Rent designer dresses, rent designer dresses uk, rent dress london, rent dresses uk, rent the runway uk, Rent the Runway UK equivalent, sustailable fashion, Your Revolving Wardrobe. Self Portrait is a young contemporary womenswear brand appealing to all women including celebrities such as Reese Witherspoon and Kristen Stewart. The brand concentrates on lace, embroidery and sheer overlays to achieve their unique feminine style. Starting from £49 Self Portrait dresses are perfect to hire for any occasion. Whether you’re going to a birthday party, the races or attending a wedding there’s a style for you! Tags: Designer Close-Up, GMD Daily, The Week in Dresses. borrow a dress, circular economy, clothing rental subscription uk Wear the Walk, designer dress hire, Designer Dress Hire UK, Dress Hire, dress hire glasgow, dress hire london, dress hire UK, dress rental, dress rental london, dress rental uk, girls meets dress, hire a dress, hire a dress UK, hire designer dresses uk, hire dress, Hire dresses, rent a dress, rent a dress london, Rent a dress uk, Rent designer dresses, rent designer dresses uk, rent dress london, rent dresses uk, rent the runway uk, Rent the Runway UK equivalent, sustailable fashion, Your Revolving Wardrobe. Sign up to our newsletter for £10 off! New to Girl Meets Dress? Why not sign up to our newsletter and be the first to know of any new styles or designers we have available to hire. Sign up now to receive an exclusive £10 off your first order! Tags: Website News. borrow a dress, circular economy, clothing rental subscription uk Wear the Walk, designer dress hire, Designer Dress Hire UK, Dress Hire, dress hire glasgow, dress hire london, dress hire UK, dress rental, dress rental london, dress rental uk, girls meets dress, hire a dress, hire a dress UK, hire designer dresses uk, hire dress, Hire dresses, rent a dress, rent a dress london, Rent a dress uk, Rent designer dresses, rent designer dresses uk, rent dress london, rent dresses uk, rent the runway uk, Rent the Runway UK equivalent, sustailable fashion, Your Revolving Wardrobe. Olivia Pinnock writes about the benefits of rental fashion for both customers and the brands. Clothing rental has the potential to make fashion retail more sustainable and provide benefits to both consumers and brands. Hiring suits for that all-important special occasion has been part of shoppers’ habits for decades. However, changes in consumer behaviour have led renting all kinds of clothing – from dresses to childrenswear – to grow in appeal for shoppers and retailers alike. Clothing rental is a sustainable alternative to the disposable fashion cycle of “buy, wear, replace”. It lets shoppers discover new pieces, and get brands in front of customers who may not otherwise wear them. Although it is not a one-size-fits-all approach, its applications are growing. The so-called sharing economy – exemplified by short-term let service Airbnb and music-streaming platform Spotify – has made ownership less of a necessity for millennials and Generation Z, who value experiences over possessions. As consumers spend more on events and holidays, and less on the outfits they wear to them, renting becomes an affordable way to still have a fresh look for all occasions. A study by shopping centre owner Westfield in 2017 found that the UK clothing rental market has a potential value of £923m. The survey showed that 25% of Londoners said they would like to rent clothing. The idea was most popular among 25-to-34-year olds, 50% of whom said they would be willing to spend £200 or more each month on hiring clothes. The rental fashion market is also being propelled by an increased interest in sustainability. Many clothing rental sites are proudly branding themselves as a greener option to the piles of unworn clothing sitting in consumers’ wardrobes. Sustainability-focused brands and retailers are exploring the possibilities of rental clothing in bid to create circular business models. VF Corporation, owner of labels including The North Face, Timberland and Vans, is considering introducing a rental clothing scheme as part of a new focus on sustainability, EMEA president Martino Scabbia Guerrini told Drapers last year. Swedish womenswear brand Filippa K, which prides itself on its sustainable credentials, has leased clothes to customers through 11 of its stores since 2015, charging 20% of the total retail price for four days of use. Rental currently represents a small percentage of sales but grew 123% in 2017. There is also more than a moral benefit to renting clothing for consumers. It makes aspirational brands more accessibly priced, it saves wardrobe space, offers a low-risk way to try new brands, and allows for a never-ending rotation of outfits that can be shown off on social media. Those businesses that crack rental fashion also stand to benefit. 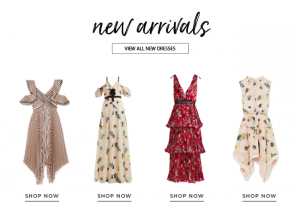 In the US, designer rental platform Rent the Runway, which was launched in 2009 by founders Jennifer Hyman and Jennifer Fliss, now has 9 million subscribers. Its revenue surpassed $100m (£79.6 m) for the first time in 2016. European start-ups are now vying to become market leaders in rental fashion on this side of the Atlantic. One such business is Front Row, which offers customers the opportunity to rent clothing and accessories from brands such as Dolce & Gabbana, Chanel, Fendi and Stella McCartney. One of the longest-standing UK players in luxury occasionwear rental is Girl Meets Dress. About to enter its 10th year in business, it has an inventory of more than 4,000 dresses. Outfits can be rented “pay as you go” or through an “unlimited” subscription package of £99 per month. The latter allows shoppers to borrow up to three outfits at a time, and they can be swapped within the month. As in any ecommerce business, convenience is key. Girl Meets Dress offers free delivery and returns, and the rental cost includes of dry cleaning and minor repairs after return. Although the operations and logistics may be slightly more complex than a traditional one-way sales transaction, potential profit margins on each item are bigger. Traditional models have a fixed margin once the cost price and retail price are agreed, but rentals can continue to make profits if they are loaned out more times once they hit their target. Although most businesses operating in this area are focused on high-end fashion, there is a case to be made for affordable brands, too. Brands on Hire Street include Topshop, Asos, French Connection and PrettyLittleThing. Average rental prices are £10-£20 for 10 days. A year after launch, West is concluding her first round of fundraising, and says the business has grown through embracing a social media-loving audience who is enthusiastic about the concept. “Customers are so grateful that we have saved them money and they love the experience so much that they’re actively talking about us [on social media] and they’re actively tagging us in their content. They are proud that they’re renting,” she tells Drapers. In Germany last year, one of the country’s largest retailers, Tchibo, launched Tchibo Share, a website offering children’s clothing hire. A coffee brand that is also known for selling other goods including value clothing, Tchibo has partnered with Kilenda, a children’s clothing rental start-up, to run the operational side of the scheme. The site offers clothes from Tchibo’s own-brand line, which is also sold in stores. Prices can be as little as €0.60 (54p) per month for a babygrow, and average rental times are around four months. The lifespan of rental childrenswear is shorter, because of excessive wear and soiling, but Tchibo Share aims to rent out each garment a minimum of four or five times. Repeat customer rates are high – around 70% of renters came back to rent more during the initiative’s first year. Hoping to tackle this issue, Netherlands-based denim label Mud Jeans has adopted a different approach in line with its circular business model. Alongside traditional selling, customers can pay a flat rate of €29 (£26.04) and then €7.50 (£6.74) per month, per pair of jeans, for a year. This works out at the same cost as buying upfront. At the end of the year, consumers can choose to keep their jeans or – the most popular option – exchange them for a brand-new pair and continue leasing. Around 3,000 members across Europe use the service. The returned jeans are sold as vintage or recycled to make new pairs. Danique Gunning, marketing manager at Mud Jeans, explains that it is important for brands to know what they will do with garments at the end of their life. The UK clothing rental market remains fragmented. A range of business models operate within it, and large multiples have not even begun to play catch-up with the start-ups – possibly as a result of huge change in infrastructure it would require. Appetite for rental fashion from price-savvy, sustainably conscious customers is increasing though. Fashion rental is an option that allows shoppers to take positive step towards sustainability that can also improve margins. But it is unlikely that consumers will ever hire their entire wardrobe, and a market for fashion purchases will, of course, remain. Tags: Features. circular economy, clothing rental subscription uk Wear the Walk, designer dress hire, Designer Dress Hire UK, Dress Hire, dress hire glasgow, dress hire london, dress hire UK, dress rental, dress rental london, dress rental uk, girls meets dress, hire a dress, hire a dress UK, hire designer dresses uk, hire dress, Hire dresses, rent a dress, rent a dress london, Rent a dress uk, Rent designer dresses, rent designer dresses uk, rent dress london, rent dresses uk, rent the runway uk, Rent the Runway UK equivalent, sustailable fashion, Your Revolving Wardrobe.